CIVIL – Center for Freedom and the Municipality of Tetovo today signed a Memorandum of cooperation against violent extremism. 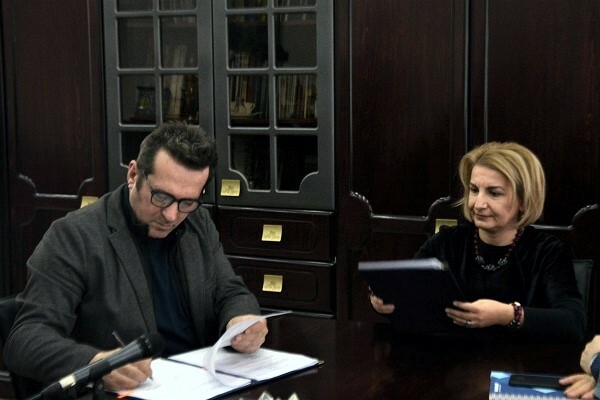 The Memorandum was signed by Xhabir Deralla, on behalf of CIVIL, and the Mayor of Tetovo, Teuta Arifi. “We as an organization, in cooperation with the competent institutions, will try to strengthen public awareness among citizens on the dangers of violent extremism, and to contribute to prevention, as well as understanding of all motives that would lead to radicalization of young people and other individuals or groups in society. Peaceful and non-violent communication with the institutions is what we are offering as an exchange for violent extremism” – said Xhabir Deralla from CIVIL. Mayor Arifi stressed that Tetovo is part of the network “Strong Cities”, and that an appropriate solution can be reached only through dialogue and understanding. After the signing of the memorandum, a working meeting was held on the topic “Communities against violent extremism”, where representatives of schools, the police, the civil sector took part, as well as representatives of institutions that work on this issue. CIVIL’s representatives presented the project to the participants, which has the goal to contribute to strengthening the resistance of the local communities against violent extremism by forming working groups in the communities, civic education and strengthening public awareness. The events are part of the project “Communities against violent extremism”, which is supported by the US Embassy in Skopje. So far, CIVIL has signed a Memorandum of cooperation against violent extremism with the Ministry of Interior and the municipalities of Kumanovo, Veles and Gazi Baba.